How wonderful on a blistery winter day to open up fresh raspberry jam or heirloom tomatoes canned from your own garden. Enticing for all those boatloads of veggies coming out of your ears? Today’s summer word is preserve because keeping a bit of the growing season’s freshness throughout the year is part of the home-garden ambiance and charm. Let’s be honest, though. Canning is a bit of work. It’s not for the guy or gal who makes a sandwich and calls that cooking. For starters, you can try freezer jam, which is a tad easier for the berries. And a dehydrator may come in handy for things like your peppers, apples, beans – not too difficult and you can get real creative with drying. But when it comes to the tomatoes, nothing beats the flavor of fresh tomatoes stored tightly in a canning jar. You can plop all those cut-up tomatoes in a freezer bag, but the flavor and storage time is worth the extra canning effort. Besides, you can’t give a frozen bag of tomatoes for a gift. You can try but it’s awfully messy and not as tasty! Plus, where can you put the bow? 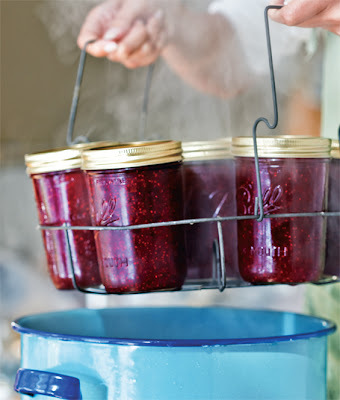 There are tons of websites and links for canning and preserving fruit, vegetables and herbs. But the best advice is tie on your apron, sterilize the jars (cleanliness is everything) and get canning. A sense of accomplishment comes from this labor of love. It takes your home garden one step further – into your cupboards for the winter months. So add the word preserve to your summer garden vocabulary. And as many foodies say, “Life is too short to eat bad food.” Oh, how true! But we’ll end with an Edward Ugel quote as it sums up where a lot of people miss the point of delicious food. “When it comes to healthy eating, people who know how to cook and make ingredients taste good have a distinct advantage over those who can't.” Want ingredients that taste phenomenal? Make preserve your word – contain that summer goodness and healthy supply of fresh fruits and veggies for your winter table.